Woman to Woman: Don't be a "but you would not"! Don't be a "but you would not"! Those four words, "but you would not" may be some of the saddest words in the Bible. Time and time again God had proven Himself faithful to the children of Israel. He'd miraculously delivered them from slavery, He'd fought for them in battle, He'd miraculously met their needs. Yet, here they were facing another challenge and instead of turning to God, which you'd think would be their first response to trouble, they decided to seek help from Egypt. God pleads with them through the prophet Isaiah, warning them that Egypt would be a stumbling block to them, warning them to turn to God instead. The words in this thirtieth chapter of Isaiah are heart wrenching as God tells them how He is waiting and longing to be gracious to them and to hear and answer their cries. But they would not turn to Him. It sounds incredulous doesn't it? But let's be honest, how often is our first instinct in times of trouble to phone a friend or to try to reason and figure out our own way through the situation? All too often I'm afraid. Take some time, sit down and read the words of God, pleading to His people through the prophet Isaiah. Oh, how He longs to help us, to pour His love and favor on us, to give us victory, to draw us near in companionship...yet we, like a stubborn toddler, insist on doing things ourself. We wrestle with our circumstances, trying to fix them and figure them out ourselves, when God wants us to rest and trust and let Him help us. This week I wrote a list of everything that's been on my mind and heart, every worry, care, concern and anxiety. I relinquished them to God and asked for Him to give me wisdom and to show me anything He wanted me to do in each situation. Oh, how much better it's been then wrestling and wrangling, fretting and fixing! I'm quite sure I'm not the only one who all too often tries to fix things, (people, situations and circumstances), when I need to trust God, turn it over to Him, and wait for His guidance and direction and help. Join me in reading Isaiah 30, in returning to God, in confidently trusting Him with everything that concerns us. Let's not be one of the "but you would nots". Elizabeth, I have always found that Scripture to be sobering. It isn't that the Lord is not there for us but that we did not turn to Him. May we turn to Him in our time of need with assurance that He is waiting for us with all that we need. Have a blessed Sunday! Joanne, I'm so thankful that God is there waiting for us to cry out to Him, that He's waiting to help us! I'm afraid I relate too much to this: "All too often I'm afraid." I don't want to be a "but you would not" though. Thanks for the encouragement, Elizabeth, to rest in God in my circumstances instead of wrestling there. I'm a notorious fixer, so this is important for me as well. 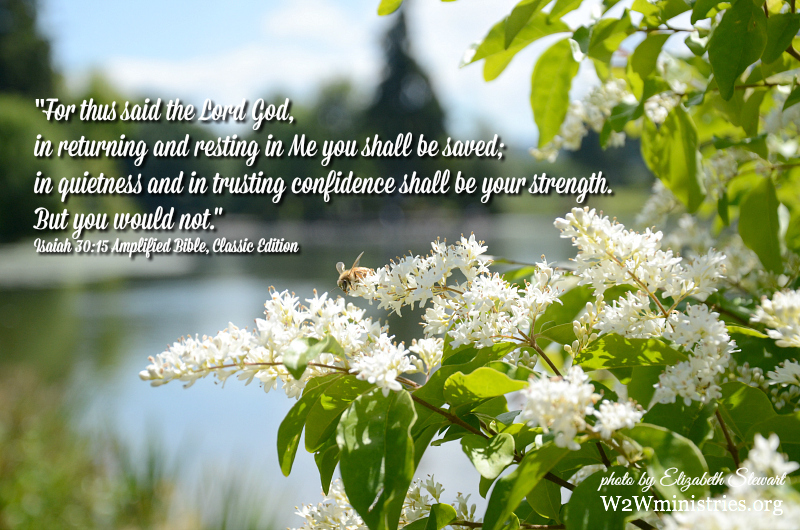 Oh, how I want to learn to return to Him, to rest and in quietness trust Him with confidence! Beautifully edifying words, sweet friend. Thank you for this gentle reminder. Cheryl, I write what God puts on my heart and is dealing with me about as well, so this is a good reminder for me, the writer, as well as for you!